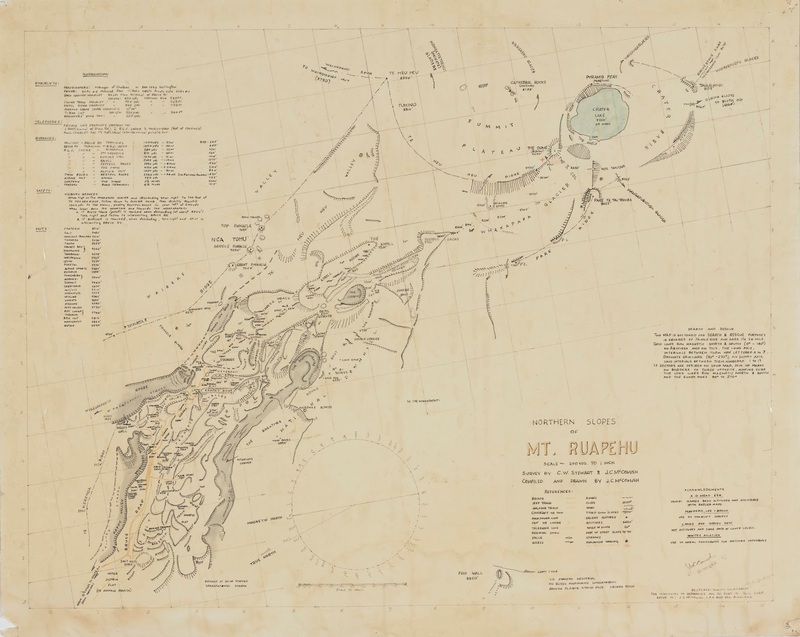 In May 2018, Auckland Tramping Club donated a fascinating map of the Northern Slopes of Mount Ruapehu to Auckland Libraries. Notes on the map indicate the survey was done by C.W. Stewart and J.C.McComish, and it was McComish himself who compiled and hand drew the map, and signed it with the date of October ’57. Further handwritten notes on the map note that it was restored in June 1972 by D.B.F. Brown, which is possibly when the map was laminated. The map covers the area from the Upper Scoria Flat to the Crater Lake and it really is a work of art – mainly black and white, it has roads, streams, huts, ski patrol bases, chair lifts and power lines in colour, although very faded after sixty years of use. As well the map, there is information on safety, distances and the locations of the three telephones on the mountain - essential information in the days before mobile phones. 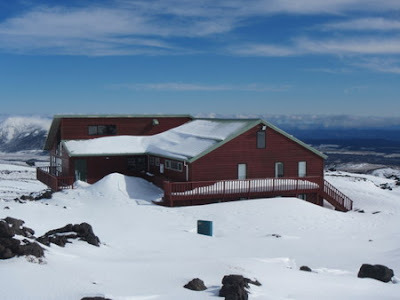 It is easy to see why the map was so useful to the tramping club, and why, according to Auckland Tramping Club President Tony Walton, it had probably been up on the wall of their Ruapehu Lodge since it was first created. However, in March 2018, the club handed ownership of the Lodge over to the Central Plateau Schools Mountain Lodge Trust, and so felt that something as unique as the McComish map should be removed for preservation. 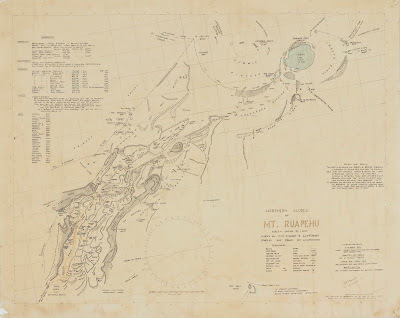 They did leave a copy of the map in the lodge, and Auckland Libraries has given a digital file of the map to Auckland Tramping Club for their records. 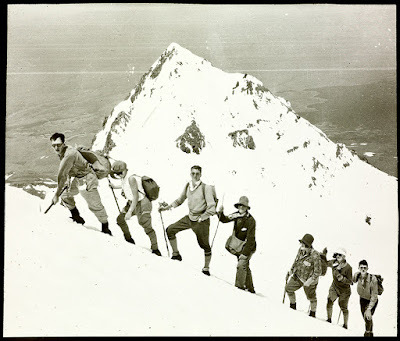 As well as the Ruapehu map, Auckland Tramping Club has made other donations to Auckland Libraries. We have their Minute Books from 1928-1975, an interesting selection of early photos of club activities and a wonderful collection of lantern slides – a search for Auckland Tramping Club on ‘Heritage Images’ on the library website, will bring up a selection to view. 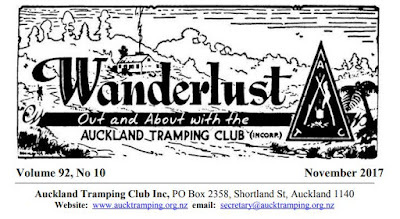 We have two histories of the club – founded in 1925 with a meeting in the crater of Rangitoto – and runs of several of their publications, including the long –running newsletter Wanderlust. The image below is of the masthead they have used since July 1941, although the magazine has been published since 1936, which is an impressive record. And if you should want to read any of those issues, just ask for them at the Research Centre desk at the Central Library. 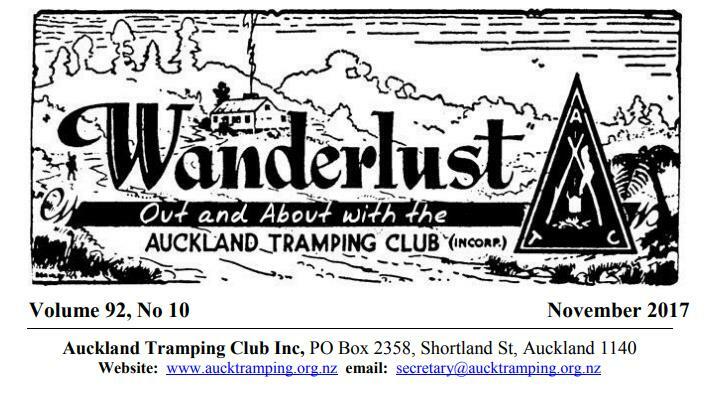 Ref: Auckland Tramping Club. Masthead of Wanderlust magazine, Vol 92, no 10, November 2017. British Newspapers Archive - a real gem!